The Weather Channel’s Mike Seidel’s live coverage of Hurricane Florence from Wilmington, North Carolina, has become an instant hit on social media. 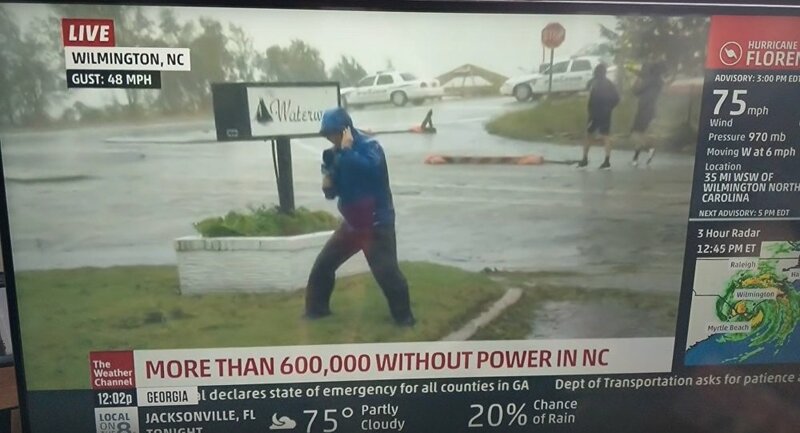 Mike Seidel, a well-known American meteorologist, whose career is marked by field reporting from hurricanes and severe snowstorms, was doing a routine live report on Hurricane Florence. As he was filmed apparently struggling to maintain his footing in the wind, the video, which has since gone viral, happened to include two passersby nonchalantly strolling around, seemingly without any strain or trouble, in the background of his live coverage. The clip was roundly blasted on social media platforms as a vivid example of media outlets sensationalizing or exaggerating the dangerous conditions of the hurricane. That’s too funny. 🙄 proof as we know that they always dramatize it. — Prinzzess Felicity (@realprinzzess) 16 сентября 2018 г. — Deanna Rashell Actor (@DeannaRashell) 16 сентября 2018 г. The hilarious thing is those 2 in the background are THE MOST CASUAL WALKERS I’VE EVER SEEN!!! The definition of a Sunday Stroll!! I think one dude is even chatting on the phone without a single care in the world. What a clown the reporter looks like…definition of a TOOL! — Gangsta Nicky P (@313Palmer) 16 сентября 2018 г. — Jamal Dajani جمال (@JamalDajani) 14 сентября 2018 г. — Joe Dirt (@Joedirt3012Dirt) 15 сентября 2018 г. — Lard of Dorkness (@LardFDorkness) 14 сентября 2018 г. — 𝕶𝖆𝖙 𝕱𝖚𝖑𝖌𝖊𝖓𝖟 (@KatbeeFulgenz) 14 сентября 2018 г. Don't let the truth stand in the way of a good story. — 555|STi (@555STi) 15 сентября 2018 г. — Sam & Hannah (Sannah) (@sam_hannah_g) 16 сентября 2018 г. — Baker O'Brien (@baker5131) 16 сентября 2018 г. — The Dogpool (@OriginalDogPool) 15 сентября 2018 г. — Kelly Lacour (@kjlacky) 15 сентября 2018 г. “It’s important to note that the two individuals in the background are walking on concrete, and Mike Seidel is trying to maintain his footing on wet grass, after reporting on-air until 1:00 a.m. ET this morning and is undoubtedly exhausted,” it read.